Saks Fifth Avenue Up to 80% Off Sale. Shipping starts at $5 or free on orders over $200 with code "SFASHIP." Tax in most states. 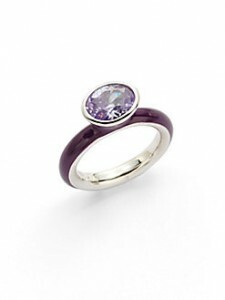 Giorgio Martello Center Stone and Purple Lacquer Ring (pictured) only $23 (reg. $115). LAmade Kids Infant Tiered Top only $7 (reg. $37). Missoni Metallic Zigzag T-Strap Platform Sandals only $223 (reg. $745).